ThurtenE Carnival, the nation’s oldest and largest student-run carnival, is pleased to announce the location for the 2019 Carnival, taking place April 12th-14th. After nearly 30 total years on the East end of the Danforth Campus in front of Brookings Hall, as of last spring Washington University’s annual family-friendly tradition now sits close to the heart of the Danforth Campus, occupying the Simon Hall and Athletic Complex parking lots, the paved portion within the entrance to Francis Field, and Olympian Way. The new, central location is expected to greatly improve visibility of the Carnival in the spring, as the Washington University community will witness the Carnival come to life while walking near the Danforth University Center, Athletic Complex, or upper fraternity row. The carnival will continue to offer attendees the rides, games, and booths they have come to enjoy in years past. The new location also marks the return of student group façades to their original home within the gates of Francis Field. This is not the first time the carnival has relocated to accommodate changes on the Danforth campus. Originally held on Francis Field in 1907, the carnival has been held in the Field House, the parking lots west of the Athletic Complex and, most recently, the parking lot and allée in front of Brookings Hall. Anthony J. Azama, Washington University’s Director of Athletics, also expressed enthusiasm about the launch of the new historic Carnival site, stating: "It's exciting ThurtenE is returning to its original location on the west end of campus. Events driven to bring the campus and surrounding communities together like the carnival are great traditions." ThurtenE representatives are working closely with University and student leadership to ensure a smooth transition to the new location. Logistics for parking and student construction are currently being fully operationalized, and relevant details will be released as they are finalized moving forward. 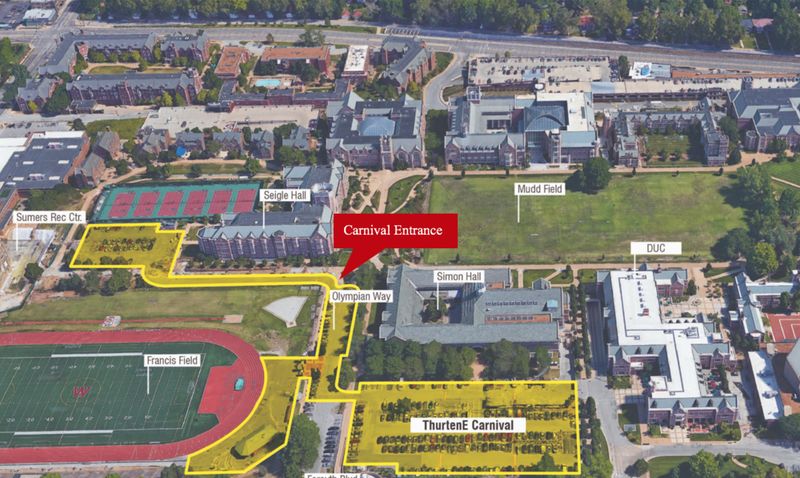 The carnival will occupy the Simon Hall and Athletic Complex parking lots, Olympian Way (Lots 31, 33, and 35), and the paved portion within the entrance to Francis Field. In order to host the ThurtenE Carnival in this location, parking in Zone 2 will be more limited. The Simon Hall and Athletic Complex parking lots will be closed beginning Wednesday morning, April 10. A majority of those lots will be open once again beginning on Monday, April 15. The full parking area will be open by Tuesday, April 16. The remainder of Zone 2 will be open for parking, however to accommodate the need for overflow parking, Zone 2 permit holders may park in the Wallace Garage on the South 40 between April 10-13. We will have volunteers on site the mornings of Wednesday, Thursday, and Friday April 10, 11, and 12 to provide assistance with parking. We appreciate your understanding and patience through this three-day period and hope you will attend ThurtenE Carnival! Guest parking will be available in any of the visitor or yellow parking spaces in the Millbrook Parking Garage or Danforth University Center Underground Garage. Additional parking is available in Snow Way Parking Garage.